Pink Chair: Welcome to my Pink Chair Paintings Blog! This is a blog about painting a pink plastic adirondack chair. I'll let you in on the story as I complete the series I am doing and show you paintings as they are completed. The chair represents my mother, Carolyn Elizabeth Pedersen Schulte, who passed on June 5th, 2011. She was a wonderful woman, full of love for everyone around her, and she loved this bright color pink. She was proud of me as an artist and would love what I am doing. 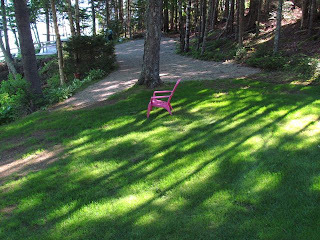 I take the chair to favorite places of hers and to places or situations I know she would have liked. It is a way for me to grieve and to celebrate her life. I talk to her as I paint and make sure that she would want to be where the chair has been placed. Welcome to people checking out my blog! I hope you enjoy coming along on my journey! Thanks Bill. Don't tell PEM that, on the other hand, maybe they'd like my work there too. Lynn, Having lost my mother on August 30th of last year I am deeply touched by your project. As artists we are fortunate to have creative ways of remembering and sharing the memory of our loved ones. I began a project about my mother years ago and have finally found the direction of the work and am now actively working to fulfill my artistic vision in her memory. The title of the collection is "Surviving Survival: The real legacy of genocide survivors and their family in America". A partial showing of the work has been on exhibit at the Salem Theatre Company. The show concludes on Sunday. It was hanging in conjunction with their play, "A PIcasso". I am truly amazed by the response to the work. It is a great motivator knowing that the public is understanding my message. Bill, I continue to be honored by your response to my work.